As expected, the 5th-seeded ’83-’84 Edmonton Oilers flexed their muscle in their tournament debut with a sweep of the 28th-seeded ’09-’10 San Jose Sharks, who were a team that less than 10 regulation losses in their record. 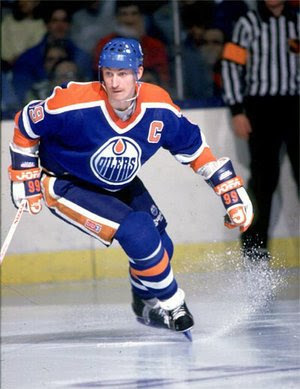 Wayne Gretzky showed a great scoring touch in this series with eight goals in the four games, added together with his four assists gave him 12 points. However, linemate Jari Kurri led the Oilers in scoring with three goals and 10 assists for 13 points in the four games. Those two were the offensive catalyst in the series with no player on the Oilers, besides Gretzky and Kurri, registered more than five points. Mark Messier and Glenn Anderson both totaled five points with Anderson notching two goals and three assists and Messier notching one goal and four assists. Goaltender Grant Fuhr had a solid series in net, posting a 2.25 GAA and a .933 SV% in the four games. The Sharks got a fight in the 1st Round from the ’05-’06 Atlanta Thrashers, but overcame them in six games. Against the Oilers, the Sharks were more like guppies. They were outscored 24-9 in the four game sweep. Veterans Dan Boyle and Joe Thornton led the Sharks in scoring in the four games with three points each. Boyle posted one goal and two assists and Thornton posted three goals. A smattering of others posted two points, including Dany Heatley, Logan Couture and Patrick Marleau. However, many players, including Couture, had horrible plus/minus ratings with the worst of them belonging to Brad Staubitz at -8. The goaltending wasn’t much better as Evgeni Nabokov posted a horrendous .817 save percentage in the four games. So, the 5th-seeded ’83-’84 Edmonton Oilers move on to the 3rd Round and they will face the winner between the 12th-seeded ’95-’96 Colorado Avalanche and the 21st-seeded ’99-’00 St. Louis Blues. Up next in the 2nd Round is…….the ’95-’96 Avalanche versus the ’99-’00 Blues. This entry was posted in 2nd Round, Ultimate NHL Playoff and tagged 2nd Round, Brad Staubitz, Dan Boyle, Dany Heatley, Edmonton Oilers, Evgeni Nabokov, Glenn Anderson, Grant Fuhr, Jari Kurri, Joe Thornton, Logan Couture, Mark Messier, Patrick Marleau, San Jose Sharks, Ultimate NHL Playoff, Wayne Gretzky. Bookmark the permalink.